EspañolA Paraguayan Supreme Court justice resigned on Tuesday, December 2, one month after accusations surfaced regarding ties to an alleged drug trafficker. Judge Victor Nuñez submitted his resignation without clarifying his reasons for his decision. “I have the pleasure of addressing V.E. 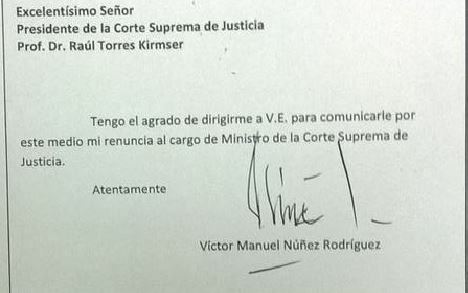 to hereby declare my resignation as Minister of the Supreme Court,” reads Nuñez’s brief note addressing Chief Justice Raúl Torres Kirmser. Authorities questioned Núñez over his release of Vilmar Acosta in 2011, while he was the president of the Constitutional Chamber of the Supreme Court. Acosta, the Red Party former mayor of Ypehu, is now under investigation for his alleged role in the murder of journalist Pablo Medina and his assistant, Antonia Almada, in October. Medina, who covered contraband and drug-trafficking stories, accused Núñez of being behind the maneuvers that allowed Acosta’s release. At the time, Acosta was already under investigation for a double homicide in the border town of Paranhos in Brazil. The chairman of the Chamber of Deputies, Hugo Velázquez, visited the judge on Monday night at his home and told him that he had the votes to impeach him, reported local newspaper ABC Color. Núñez then resigned the very next day. In early November, Núñez indicated he would resign if there were enough votes to impeach him. “Do you believe that if [the deputies have] enough votes [to remove me] I’m going to convince them to vote in my favor? The political vote is political, neither rational nor judicial,” he said.